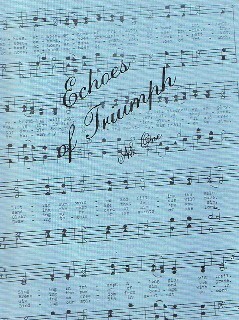 Echoes Of Triumph Books #1 - #6 are books of original songs composed by Elizabeth Drudge and Lena Martin, and are published in softcover hymnals with shaped notes. The touching lyrics and stirring melodies are accented by the beauty of four part harmony. In these books you will find new songs of Praise and Worship to God, songs of encouragement in trial, songs in memory of loved ones, and songs about Heaven and the Coming of the Lord. Book #1 has all the first songs that were written and composed by Lena Martin and Elizabeth Drudge. This book starts with the title song - Echoes Of Truimph; other favorites are #16 - Our Heavenward Flight,which is the song about a house fire in Dorking Ont. when five children died, including Lena's son's best friend at school; #5 - Deeper Than The Sin Stains, which has been used by many Bible Schools over the years; #8 - Even So Come Lord Jesus; #9 - Only One Step; #13 - Canaan Land; #24 Home Blessed Home. 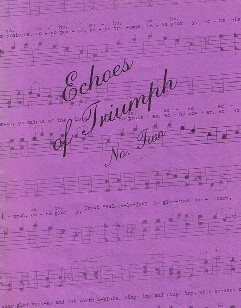 Book #1 has 34 original compositions for a cappella singing. These books have been used by thousands of Christian people to bring encouragement at times of heartache, distress, and grief. Because these songs were written about specific events, or were inspired during times of trial and grief, they become more meaningful as you sing them, for you can feel what the songwriter has been through, and we can identify with them. 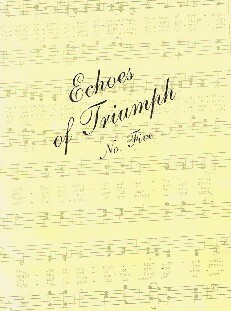 Echoes Of Triumph Book #2 was first published in 1982. After book one was printed, there were still some songs unprinted, and so we printed another book. 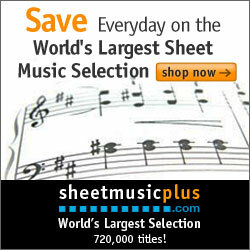 Some favorites in this book are #2 - The Wheel of the Mill; #5 - Don't Hang Your Harp on the Willow Tree, taken from Ps. 137; #7 - Someone Needs Your Smile; #11 - Unto Us A Child Is Born, (a Christmas Song), #19 - Come Holy Fire; and #34 - Gloryland Flight. Book #2 has 34 original compositions for a cappella singing. 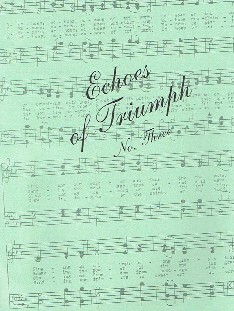 Echoes Book #3 was published in 1992. This book contains some of the most well known Echoes Of Truimph Hymns, including the top favorite of many people, #34 - Would We Truly Long For Heaven? - written for Men's voices. Written in memory of a loved one, this song has brought comfort to many. Other favorites are #2 - Is This The Right Road Home? ; #4 - Shepherd Of Love - written for Men's voices; #5 - May I Lean A Bit Harder? ; #13 - Jesus Has The Key; and #17 - Light Up The Corner; #19 - Redeemed By The Blood Of My Crucified Lord, (with Descant); #21 - In The Splendor Of The Sunrise, an Easter Song; #23 - Jonah Went Down, a song for school children. If you're looking for a new Happy Birthday song, find one at #28! The final song of this book is a 6 page Anthem for choirs or Bible Schools called O Lord God of Israel, taken from II Chron. chapters 5 & 6. Book #3 has 35 original compositions for a cappella singing. A well known favorite in book #4 is Roses Shed Their Sweetest Fragrance, #9 is arranged for male voices, and #10 is arranged for mixed voices. Two wedding songs have been widely used, #7 - The Wedding On High, and #8 - Heavenly Father, At This Altar, for male voices. Book #4, published in 1999, has 36 original compositions for a cappella singing. 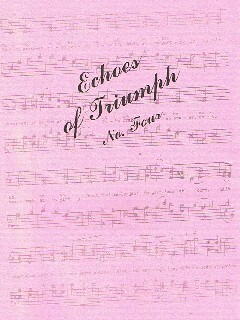 Echoes Of Triumph Book #5 contains 16 songs that were written after the Nickel Mines Amish School tragedy on Oct. 2 2006, when 5 little girls were killed, and 5 little girls were injured. Families and homes were changed forever, but God was there with Grace and Strength. The day after the tragedy, Elizabeth was asked by a member of the Amish community to write a song in memory of the little girls who died. In February 2007 Elizabeth and John visited the Nickel Mines families. These 16 songs speak of some of the grief and healing of the families involved. Some song title are #2 - There's a Light At The End Of The Tunnel; #14 - Tears Of The Angel; #15 - Forgiveness Sent A Light. This book has 22 other songs including #24 - Bring Your Alabaster Box; #32 - The Song Of The Thunderstorm; #36 - Can I Survey The Love Of God? Book #5 was published in 2007, and has 38 original compositions for a cappella singing.